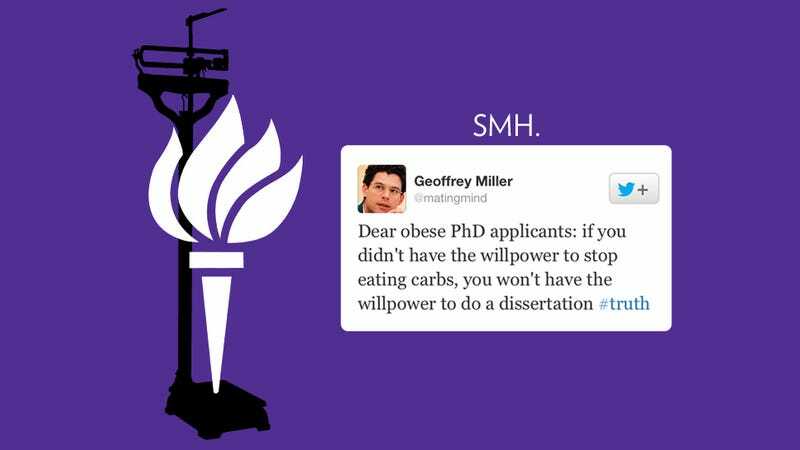 Geoffrey Miller, an evolutionary psychologist from University of New Mexico, lecturer at NYU, and the academic giant behind "The smartphone psychology manifesto", apparently believes in a strict NO FAT CHICKS (or dudes) policy when it comes to PhD applicants in the psychology department. Why is that? I'm surprised you were able to take a break from stuffing your face with carbs to even ask, fatty boom batty. CLASSIC MILLER WILLPOWER! Seriously, books will be written about the willpower he accessed before sending that tweet. Ruh roh! Who do you think got a call from the chair of his department? Oh! Maybe they called to offer him tenure? Ya think? Miller's apology isn't irrelevant, but it is suspect, and I sincerely hope that he's never allowed on an applicant review committee — or even able to conduct an interview. I guess this explains why I only got my BFA at NYU. Maybe if I'd have the willpower to lose 50 pounds, they would've been cool with taking more of my money? But honestly, I don't know how I would've gotten through my dissertation — my hands were always too busy shoveling food into my face holes* to pick up a pen. I hope it goes without saying that body weight has no correlation to the greatness of one's mind. If it did, we wouldn't have Psycho, Matt Foley, or the last two contiguous states. I'd also hesitate to not call Oprah the smartest, savviest person alive. The cruelty and inaccuracy of statements like Millers can't be emphasized enough, especially considering that many fat people read his tweet and it reinforced the societal message that our weight is our worth — not just physically, but mentally, as well. Most depressing part? This man teaches a postgraduate level Human Emotions course. SMDH all the way to the all-you-can-eat carb bar. *Yes, it took me several sit down sessions with an evolutionary psychologist to learn that the only face hole good for eating is my mouth. You shoulda seen me as an undergrad — stuffing mashed potatoes into my ears and trying to push loaves of bread into my eyeballs. Sometimes I still forget! It's so hard being fat-dumb.